R-36MUTTH Among the technical changes found in the R-36MUTTH, arguably the most important concerned advancements made in the missile’s targeting system, which increased its accuracy. This progress allowed the Soviet Union to arm the R-36MUTTH with 10 MIRVs, each of a lower yield, without sacrificing tactical efficacy (whereas the previously warheads consisted of a larger yield, which served as insurance should the missile not score a direct hit). [iii] This missile was fully operational in 1980. R-36M2 Although it is known that the Soviet Union developed the R-36M2 from the R-36MUTTH, the degree to which the R-36M2 has replaced its predecessor is unknown. Some sources cite the R-36MUTTH as remaining in service while others believe this is not the case. The R-36M2 continued a number of the trends showcased in the R-36MUTTH as it pertained to the overall performance of the missile. Range, MIRVs, Penetration Capability The 11,000km-16,000km range with which the R-36M2 operates allows the weapon system to serve as Russia’s primary option for strikes against distant targets, namely those in North America and Western Europe. 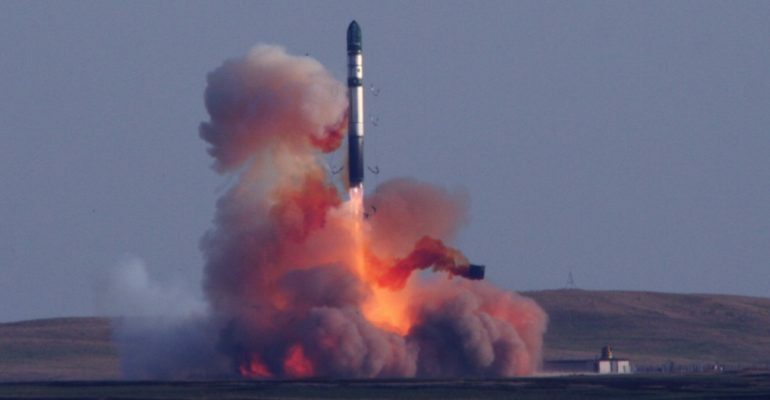 This extended range, coupled with the R-36M2’s ability to be armed with 10 MIRVs and an unconfirmed number of penetration aids (countermeasures to anti-ballistic missile systems), has caused concern among western strategists who fear this missile could represent a Russian first strike capability. The degree to which this missile is deemed a credible threat by the West has been confirmed numerous times by the weapon system’s centrality in arms control talks in past decades. 2020: The RS-28 is expected to fully replace the R-36M family of missiles. 2018: The RS-28 “Sarmat” is planned to enter service. 1990s-Present: The R-36MUTTH is phased out by the R-36M2. 1991: START I is signed by the US and USSR, limiting the number of deployable warheads and delivery systems. 1988-1991: The R-36M2 enters service with 2 variants. 1983: The development of the R-36M2 begins. 1983: The R-36M is phased out by the R-36MUTTH. 1979: The R-36MUTTH enters service. 1976: The development of the R-36MUTTH begins. 1974-76: The R-36M enters service with 3 variants. 1969: The development of the R-36M begins. [v] Fought, Stephen O., John F. Guilmartin, and Frederick C. Durant. “Rocket and Missile System.” Encyclopedia Britannica. 03 Feb. 2012. Web. 24 Jan. 2017.